Kreative Kristie: SNOWY DAY, SMITTEN, & CAKE & CONFETTI BUNDLES AVAILABLE NOW!!!! SNOWY DAY, SMITTEN, & CAKE & CONFETTI BUNDLES AVAILABLE NOW!!!! Hi everyone! You can now purchase the amazing bundles from Catherine Pooler Designs! There are 3 to choose from SMITTEN, SNOWY DAY OR CAKE & CONFETTI! All the products in each bundle coordinate together to help you create many fun cards. I had a blast creating with these bundles and I can't wait to see what you all create. We are having an Instagram Hop today to celebrate the fun release. Here is my card. 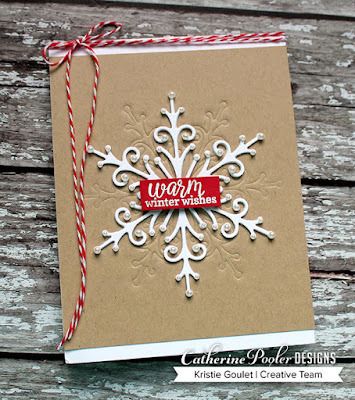 I used the gorgeous Delicate Snowflake die from the Snowy Day Bundle to create another Christmas card. I used the die to emboss on the Sand Dunes card stock and then die cut it from white card stock a few times and glued them together to create some dimension. I added some small pearls to each of the "curls" and white heat embossed my sentiment on some red card stock. I added some red & white twine to finish off my card. Catherine is also releasing some new products in the shop today. One is an amazing Envelope liner die and Envelopes! WOOHOO!!! Hope you join us for the Instagram Hop and come back here for more inspiration from me using some of these products. The Blog Hop will be Friday so stop back by then. This is just as pretty as it can be! I like your pop of red in the center of the snowflake! These snowflakes look awesome, and the red label in the middle attracts all eyes! Gorgeous card! Oh gorgeous card, great colour scheme, defiantly need to add these Christmas bits to my very minimal Christmas collection. Today I decorated the Christmas tree. I really enjoyed it! Every year I get very excited, I decorate the Christmas tree and it begins to feel like Christmas. I think this year's Christmas tree is also very beautiful. What a stunning card Kristie - love the embossed image behind the dimensional die cut.